My Account| Hello Guest, Log in! As the largest size of the Squeezetops® Child Resistant Pharmacy Vials series, the PST60 is suited to hold large quantities of products such as natural supplements, vitamins, and pharmaceutical drugs. The squeeze-to-open lid provides a unique certified child resistant design compliant with many industrial and medical standards. Squeezetops® are made in the USA with medical grade materials. Our Squeezetops series are also produced with the highest quality Class VI USP Medical Grade Polypropylene which allows for Autoclave Sterilization in the presence of Aqueous Solutions. Certifications, Regulatory Data Sheets, MSDS, and Drug Master File assistance is available upon request as we ensure and guarantee strict Material Lot Number traceability with each plastic container we produce. **It is the responsibility of the Medical Device or Pharmaceutical Manufacturer to determine that our container packaging is safe, lawful, and technically suitable for its intended use. Samples available upon request for testing purposes and validation. 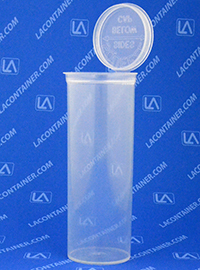 The Squeezetops® PST-60 container was evaluated using the consumer product safety commission protocol and standards. The study indicates the PST-60 container fulfills the requirements for a poison prevention package as per the current code of federal regulations (C.F.R.) Title 16, Part 1700. 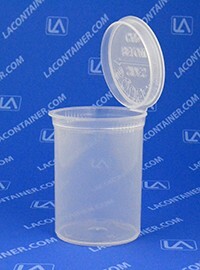 Visit ESDPlasticContainers.com if you need to order less than minimum order quantities! 1.72" Dia. X 5.13" Ht. 51.31mm Dia. X 135.38mm Ht. 43.69mm Dia. X 130.30mm Ht. 24895 E. La Palma Ave. Enter your Email address below and press "Subscribe"
Copyright LAContainer. All Rights Reserved.